WASHINGTON — NASA Administrator Jim Bridenstine played down any differences with his Russian counterpart as he gears up for meetings with him and other space agency leaders to discuss cooperation on NASA’s exploration plans. 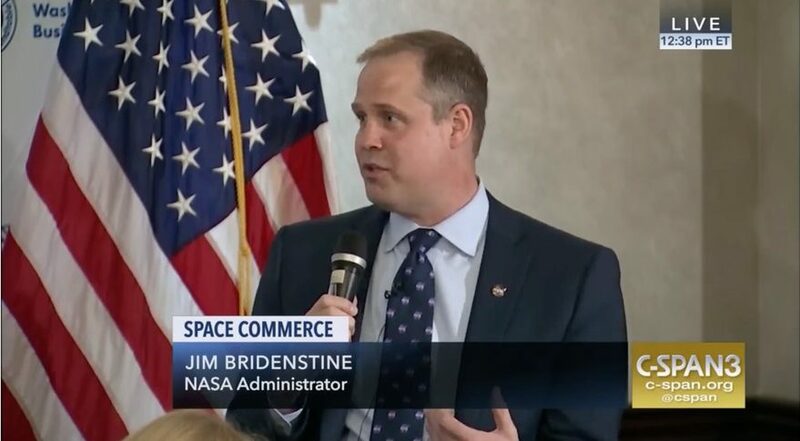 “At this point we’ve had one conversation on the telephone, and it was very positive,” Bridenstine said, a reference to a Sept. 12 call that NASA and Roscosmos revealed in a joint statement the following day. That call came after “rumors that were circulating in Russian media” about the cause of the Soyuz leak, he said. He didn’t elaborate on the rumors, but some of those reports had blamed American astronauts on the station for causing the hole. That investigation won’t affect plans for the next Soyuz mission, Soyuz MS-10, scheduled for launch Oct. 11. A flight readiness review for that mission has been completed, he said. “Our rocket scientists have signed off on it as being ready to go,” he said. Bridenstine plans to attend that launch from the Baikonur Cosmodrome and meet with Rogozin. In his prior position as deputy prime minister, Rogozin was often critical of the U.S., even suggesting at the height of the crisis over Russia’s annexation of Crimea in 2014 that the U.S. would have to rely on trampolines to access the ISS. However, Rogozin has also suggested that Russia might reconsider plans to participate in NASA’s lunar Gateway under development. Speaking Sept. 22, Rogozin said, “Russia simply cannot afford to take a back seat in foreign projects,” and hinted that Russia might instead pursue its own lunar exploration plans, according to the Tass news service. A spokesman for Roscosmos later said that Rogozin’s comments didn’t mean Russia was abandoning any cooperation on the Gateway. NASA’s Gateway plans are likely to be a topic of discussion next week at the International Astronautical Congress (IAC) in Germany. Bridenstine is scheduled to attend and speak on a panel there Oct. 1 with several other space agency leaders, including Rogozin, which will be followed by a press conference. Bridenstine said he plans to emphasize language in Space Policy Directive 1 that calls for the development of both commercial and international partners to enable a sustainable return to the moon. “What I’d like to do is head out to the IAC and share with them our vision for getting back to the surface of the moon and then, where it’s appropriate, have these partnerships develop,” he said.